Colocation service is only as reliable as the data center it's provided by. With Aecero your infrastructure will be hosted in the Aecero Critical Business Exchange, one of the most remarkable facilities in Southern California. The Aecero team continually develops better solutions. One example is our unique use of sliding doors across one complete side of our cages, allowing easy access to both the front and back of your racks. This allows you to maximize the use of your space and avoid having to squeeze into awkward, tight spaces. If a cabinet is all you need, you'll be happy to know our custom cabinets are also extra deep to allow plenty of room for power distribution units and cable management. Whatever your needs may be, our team is dedicated to empowering your growth. From initial planning through to your move-in, we'll proactively work with you to ensure a smooth transition to our facility. As part of this process we focus on minimizing the costs and hassles associated with over-estimating, or worse, under-estimating, your power, space, and connectivity requirements. Private suites, up to 11,000 sq. 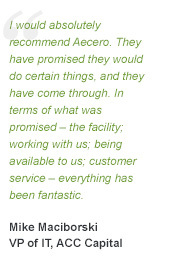 ft.
Aecero stands behind our services. We are so confident in the resiliency of our data center that we offer 100% Service Level Agreements (SLAs) and would be happy to show you the multiple layers of redundancy which enable us to deliver this. Please contact us today to learn more!